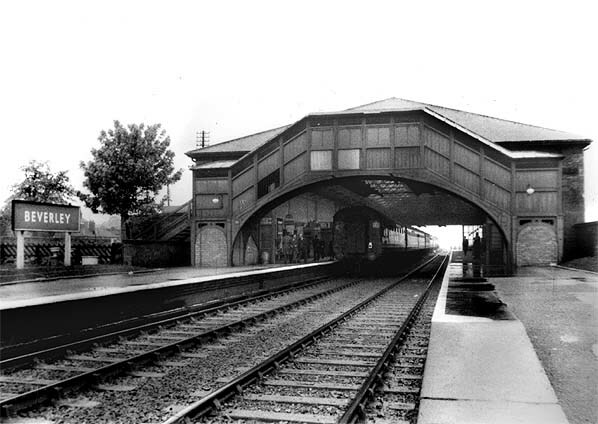 Notes: Beverley station was opened by York & North Midland Railway. 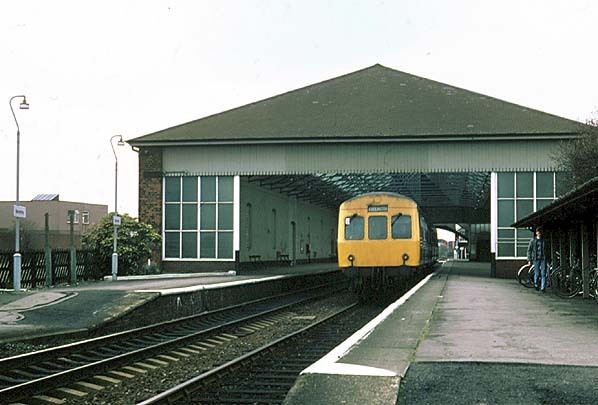 The station had two facing platforms and, being one of the larger communities in the East Riding, the station was given an overall (trainshed) roof in line with company policy. Like all stations on the line, Beverley was designed by George Townsend Andrews. The main station building was on the northbound platform at the end of Railway Street. There was a range of low buildings with tall chimneys and deep windows, fine cornices, and stone quoins. The stationmaster's house was incorporated into the south end of the building. Rooms included (from north to south) toilets, porters’ room, general waiting room, stationmaster's office, booking office, booking hall, refreshment room and then domestic rooms for the stationmaster. intermediate stops at Tickton, Routh, Long Riston, Leven, and Brandesburton. However, despite appearing on tiled maps of the North Eastern Railway's network at several of the company's stations, the branch was never built. There were extensive goods facilities at the station, and these were sited on both sides of the line, north and south of the station. To the north of the station there was a large coal depot on the west side whose entrance was in Railway Street, with cattle docks and pens on the east side. South of the station the large brick goods shed was west of the line, with a railway warehouse to the east. One of the sidings also traversed the level crossing, passing to the east of the trainshed. In 1911 the population of the station’s catchment area was 18,587. 167,616 tickets were sold that year, and the main freight handled was cement with 5,360 tons, oil cake (3684), grain (2631) and manure (2170) being dispatched. In 1913 1,119 wagons of livestock were loaded at the station. Today the station has a basic half-hourly service to Hull and Bridlington, with nine trains a day extended to Scarborough on weekdays. At peak times, a number of extra trains from Hull terminate/start here. Some services to Hull continue to Doncaster and Sheffield or York. Trains run hourly in each direction on Sundays, with two-hourly extensions northbound to Scarborough all year since the December 2009 timetable change - this service level previously ran only in summer. 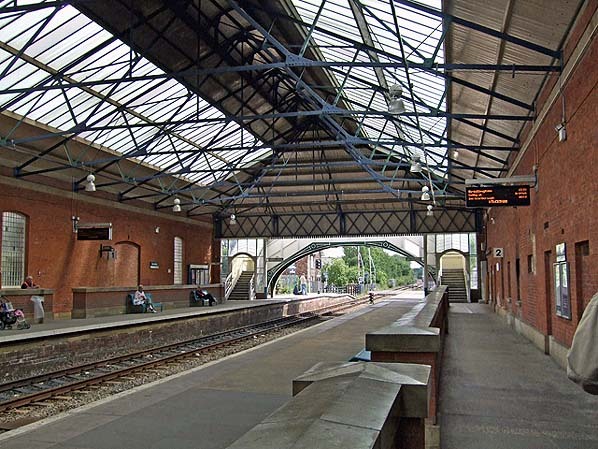 In recent years the station has undergone extensive restoration which has included the removal of all the paint on the inside walls to reveal the original brickwork, and removal of the canopy over the station entrance which has been replaced with a replica of the original portico. For many years Beverley had an award-winning station garden at the south end of the station. Burnby were open by June 1848 whilst the other stations first appeared in Bradshaw in July 1848. There were two further stations, both short-lived: Yapham Gate, between Fangfoss and Pocklington, first appeared in Bradshaw in February 1855 and last appeared in April 1865, and Londesborough Park, a private station for George Hudson between Shipton and Burnby, might have opened with the line and closed in January 1867.
an intermediate station at Goodmanham to the east of Market Weighton as well as Kipling Cotes (serving little more than a couple of farms) and Cherry Burton – Goodmanham was not built. and concerns of the official railways watchdog were ignored, and the Transport Secretary, Barbara Castle, approved the closure. The final trains ran on Saturday 27th November 1965, the very last being a six-car DMU running the 9:42 p.m. from York to Hull. Despite the snow, the train was packed with local people and enthusiasts eager to travel on the last train. 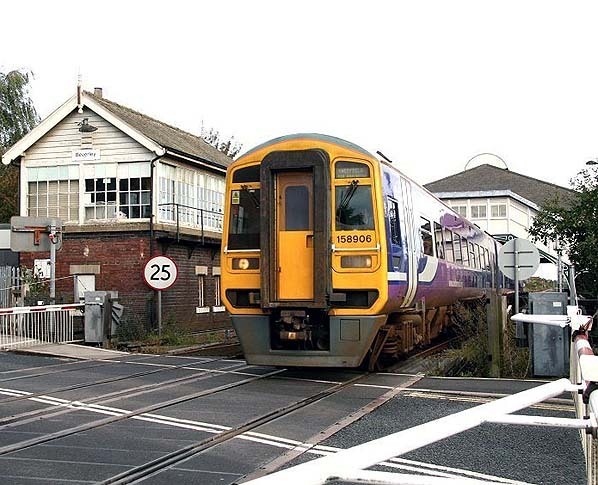 East Riding of Yorkshire Council's Local Development Framework Transport Development Plan suggest that new routes into and around these existing built up areas have been identified and safeguarded alongside potential sites for new stations. Additionally section Section 6.63 of the Council's Core Strategy Document (published for public consultation in spring 2008) states: ‘...it is recommended that land for the following strategic infrastructure and transport schemes be protected from conflicting development: Railways - Beverley to York railway route; and Rail links to employment land at Melton, Hedon Haven and Carnaby. (if allocated). Tickets from Michael Stewart, timetable from Alan Young, route map drawn by Alan Young. 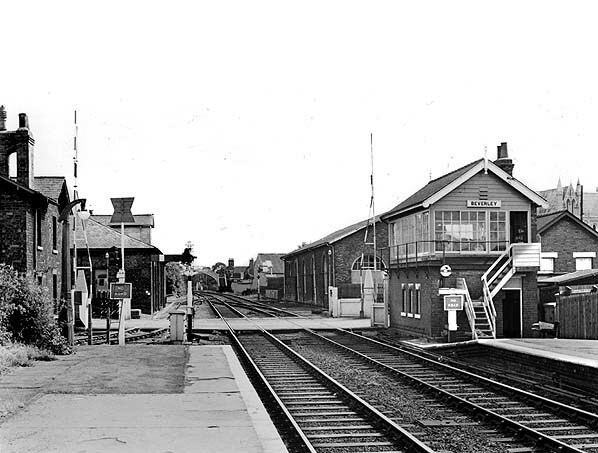 Beverley station looking north in 1957. 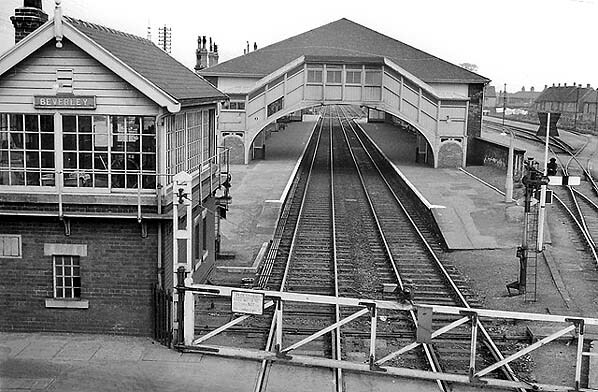 Looking north towards Beverley station in April 1961. The 14.50 Hull - York DMU arriving at Beverley station on 27th November 1965, the last day of public service on the York Line. 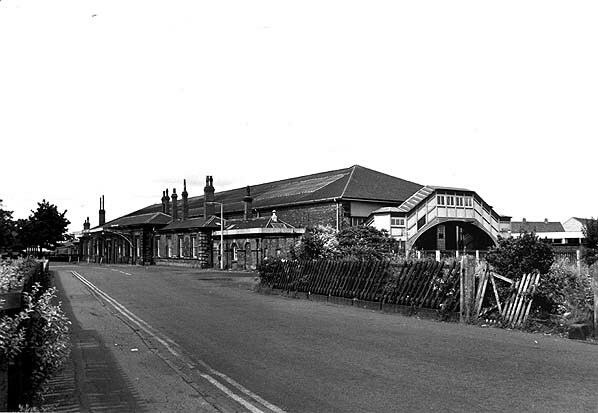 Beverley station forecourt in July 1973.
a warehouse on the left. 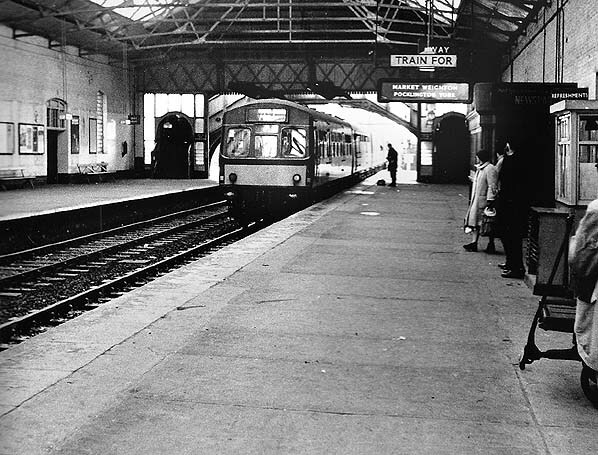 A Hull DMU waits at Beverley station in April 1974. 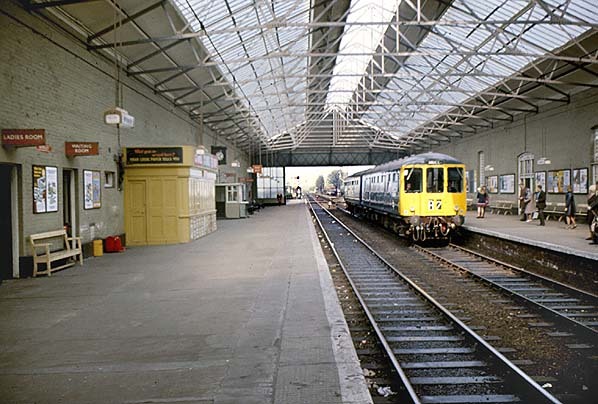 A Bridlington DMU waits at Beverley station (looking south) in March 1987. Beverley station looking south in June 2008. Northern 158906 emerges from below the overall roof at Beverley station on 1st October 2008 and is about to clear Armstrong Way level crossing with a southbound from Bridlington which will call at Hull and Doncaster on its way to Sheffield.